Build Madison is back! Come join us for at the 7th annual hackathon event coordinated by Capital Entrepreneurs and Sector67. The event, which will be hosted at Sector67, gives entrepreneurs an awesome opportunity to get going on that project you have been putting off for too long. The 24 hour community create-a-thon will start Saturday, November 19, at 11:00 am and will go through the night and into the early ours of Sunday morning. 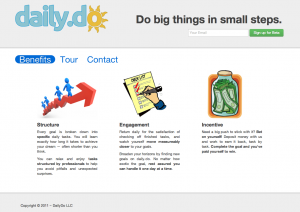 Come ready with a short pitch (<1 minute) if you have an idea you want to start working on. If you do not have a specific project in mind, then you can come collaborate with others and spend the next 24 hours helping to make an idea come to reality. At the end of the event, we will come together for short project presentations as well as feedback sessions. This event is FREE and is open to anyone who wants to tap into their entrepreneurial ambitions. We encourage participation from students, software developers, artists, hackers, business minded people, engineers, and anyone else who wants to get involved! We’re excited to announce the 5th annual Build Madison event coordinated by Capital Entrepreneurs and hosted at Sector67. 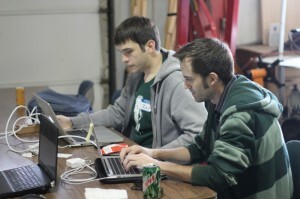 Build Madison is a 24 hour hackathon that gives you the opportunity to set aside some time over the weekend to finally get to that project you’ve been thinking about for a long time! The weekend starts out on Saturday, November 8th, at noon, when we’ll host short (<1 minute) pitches from anyone who has a project they're contemplating working on. This will allow people who don't have their own project to work on to collaborate with others; and also to get a general idea of the kinds of projects to expect for the next 24 hours. After that, you can spend the next 24 hours working with others or on your own project, and when noon on Sunday swings around we'll have short project presentations and/or sharing of lessons learned (aka: why my project didn't quite get done in time!). That's as simple as it is - take the 24 hour period as seriously or as inquisitively as you'd like. In the past, projects have varied from very sophisticated to very basic, software to hardware, art to engineering - so don't feel like your concept isn't going to fit in - it will. This is a FREE event. Please register at the Build Madison website to attend. 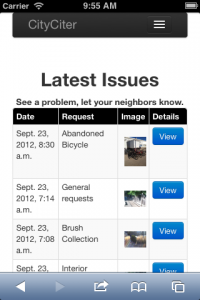 Check out the prior project summaries here. Build Madison Returns November 23rd! 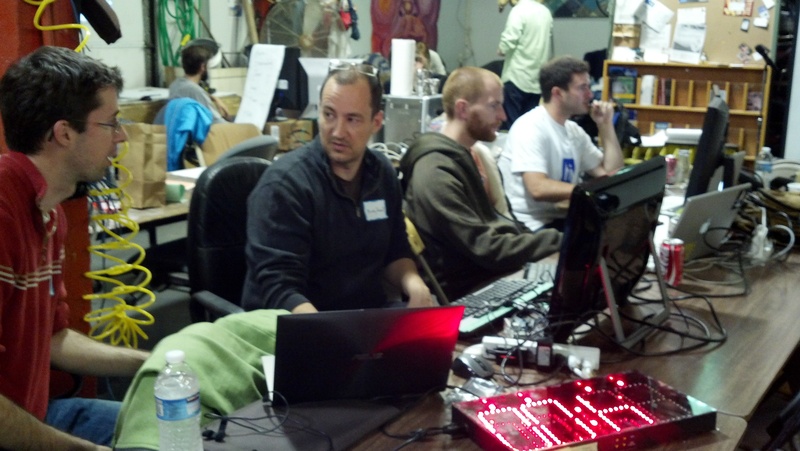 The 2013 Build Madison will be held Saturday, November 23 at Sector67. 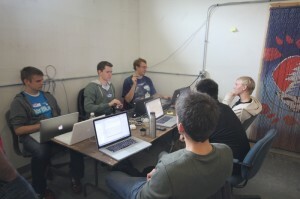 This will be the 4th iteration of the Build Madison “Community Create-a-thon” event since it started in 2011. Come together to show off and build the talent of Madisonâ€™s community while taking real products from concept to completion in just 24 hours. Meet great people, learn new skills, and have a great time. Check out the Live Blog from the 2012 event here. The event format will be similar to the previous events: idea pitches start at 2 PM Saturday, followed by team formation and open build time throughout the day and night. Then project presentations start Sunday at noon (public welcome for the presentations). If you have an idea youâ€™ve been wanting to make into reality- pitch it! A number of teams in the past have gone on to successful launch; take advantage of the experienced and talented crowd to get the team and support you need. 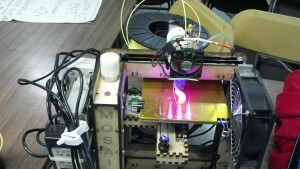 Projects are expected to span from arts and crafts to software, hardware, electronics, and more. 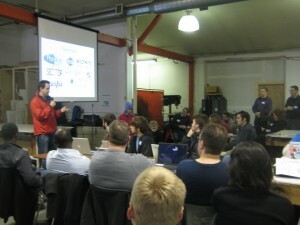 For more information, past Build Madison recaps, and to register (itâ€™s free!) go here. If you grab an Isthmus this week you’ll notice a number of Capital Entrepreneurs companies featured in the cover story on Apple app development in Madison. The article profiled 8 local developers, including PerBlue, SnowShoe, Asthmapolis, Pinpoint Software, Door 6, Fishidy, TheoryThree Interactive, and MobileIgniter. The article focused on what it’s like to be an app developer, as well as the ecosystem that exists in Madison including supporting groups such as Capital Entrepreneurs, Build Madison, and the Forward Technology Festival. We’re smart enough to see the possibilities here in Madison, and accordingly the tech startup scene around iPhone apps is smoldering… Mobile startups are making a dent in the universe from right here, and it’s changing the way that computer professionals who live in Madison are relating to the global technology community. Be sure to checkout the full article here. Project details are now available here. Thanks to everyone who participated! Check out the Wisconsin State Journal coverage of Build Madison here. We’ll also be posting a full recap and project descriptions soon. 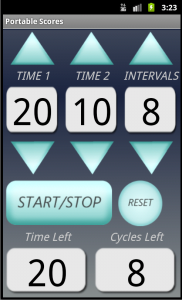 Sunday @ 6:15 AM – (An update from Mike Fenchel) The Portable-Scores prototype counting down the hours shows a bright red “4:50” above the weary but determined group of 30 or so individuals that have stayed the night. A slightly muted but determined atmosphere presides as people are amazingly still just as focused on their projects as they were when they began over 19 hours ago. Fueled by dubstep, caffeine, the desire to finish and the thought of free breakfast each of us are pushing on and taking our projects to new heights. It’s cool to see people come together to work like this. Many are enjoying and learning from the others on their team, and even those who decided to work alone have been saying how the atmosphere and event has pushed them to make progress on things they usually only think or talk about. Mike takes a quick rest. 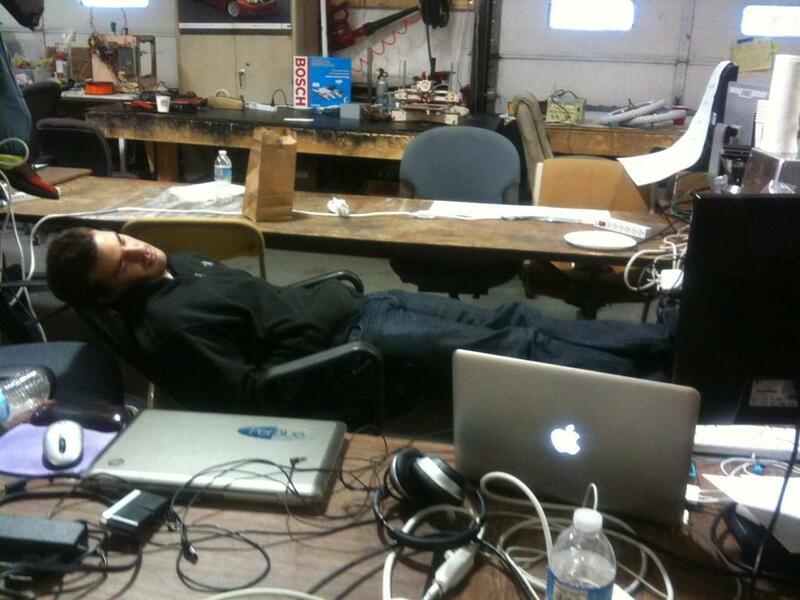 Yes, it is possible to work with your eyes closed at #BuildMadison! But then I thought about how Peter mid-way through joined the team and already finished an Android app that works with the server I built, and how Will has made an awesome design that’s going to make our users really love their experience. And I also started realizing that before today I’d never even attempted anything this technically involved in just one day, and how much I’ve learned in the past 20-ish hours. Well, writing is giving me a second wind, guess I’m gonna dive back in and see what I can’t figure out and get finished up. Hope everyone’s sleeping well and grabbing a few winks for all of us! Saturday @ 9:00 PM– The massive platters of subs, chips, and cookies for dinner have all but disappeared. 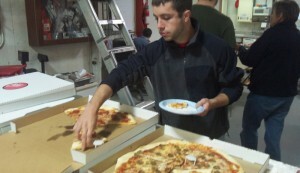 Everyone has refilled and refueled and is back to building. 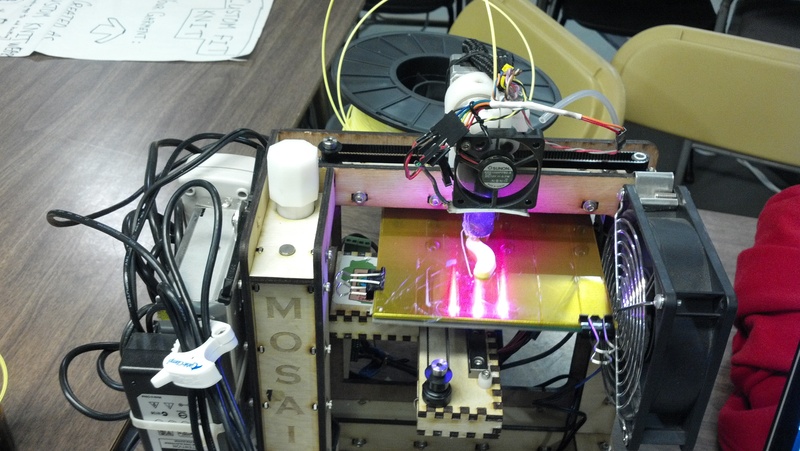 The machine shop is occupied, 3D printers are making more 3D printers, and the coders are coding. Everyone is in the groove and cranking away, and the late night libations are flowing. Great progress is being made all around. 15 hours to go! Saturday @ 5:00 PM– The 2012 fall Build Madison is underway! This is the 3rd iteration of the popular event organized by Capital Entrepreneurs, and this one is bigger and better than ever. 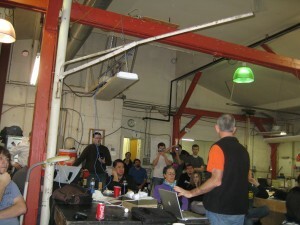 Nearly 75 people showed up at Sector67 in Madison today and pitched 23 different potential project ideas. 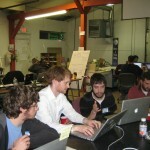 Of these, teams ended up forming around 20 projects which are now being worked on. Besides being the largest Build Madison to date, itâ€™s also home to the largest variety of vastly different projects. Teams are working on projects including apps, tutoring, insurance, civic services, 3D printing, car parts, shoes, bikes, and more. Thereâ€™s even a team making soap! Team sizes range from 1-5 members, each bringing differing backgrounds and skill sets to the table. Espresso and computers. Quite the setup! Build Madison is back with a few new tweaks and the same old crew to run our 3rd Community Create-a-thon Saturday-Sunday September 22-23, and it’s going to be the best one yet! Come together to show off and build the talent of Madison’s community while making real products from concept to completion in just 24 hours. Meet great people, learn new skills and don’t forget to enjoy the food, drinks and prizes put up by our great sponsors to fuel our creative fire. The event layout will be similar to the previous two: idea pitches starting at 11 AM Saturday, team formation, open build time throughout the day and night, and then presentations/prizes Sunday at noon. We’ll be providing snacks, drinks and dinner on Saturday as well as breakfast for the over-nighters early Sunday morning. If you have an idea you’ve been wanting to make into reality- pitch it! A number of teams in the past have gone on to successful launch; take advantage of the experienced and talented crowd to get the team and support you need. We’re also adding a panel of experienced entrepreneurs to give feedback on presentations and help groups take their projects to the next level. 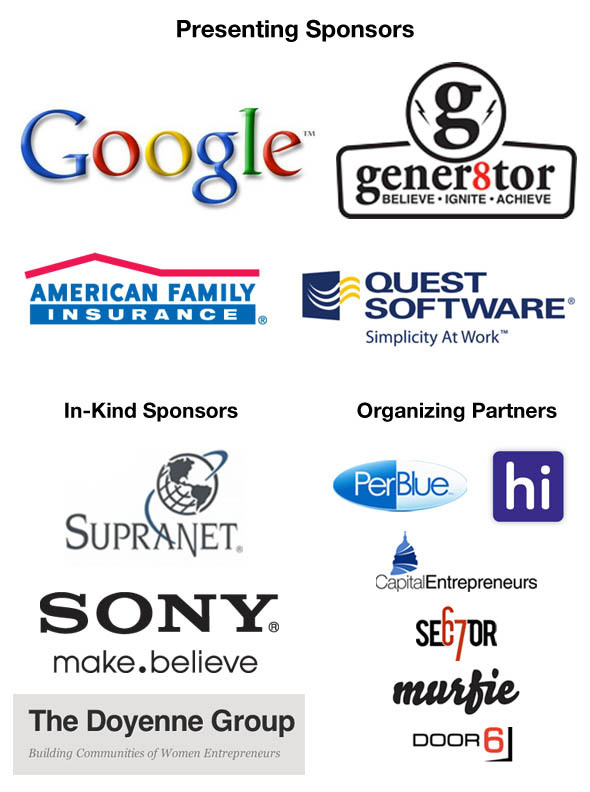 Build Madison is organized by Capital Entrepreneurs. 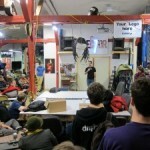 Check out past Build Madison recaps here. For more information and to register (it’s free!) go here. Reposted from the PerBlue Blog. Hey all of you smart people out there! The 2nd ever Build Madison is taking place this weekend. This 24 hour community create-a-thon kicks off at 11 am on Saturday, September 24 at Sector67 in Madison. PerBlue is again one of the presenting sponsors and weâ€™re pumped. Now what exactly is a create-a-thon? 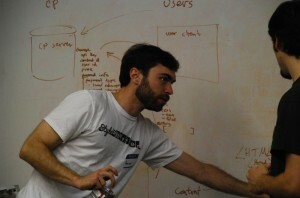 Think of it like a hackathon, but itâ€™s not limited to just programming based projects. You can “create” just about anything. 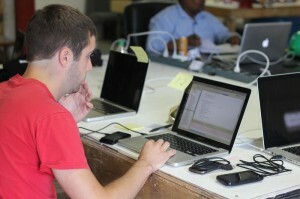 Last time teams worked on everything from iPhone and web apps to microcontrollers to stop-motion videos. There is nearly $1000 is cash prizes + a bunch of other prizes too. Registration is free, and there will be food and drinks throughout the event. It’s being organized by Capital Entrepreneurs and is sponsored by Google, Sony, PerBlue, SupraNet, 94labs, Schematical, Flatt Cola and more. If you have an idea for a cool project to work on (whether it be a website, widget, or pretty much anything really) this is your event. Bring your idea and meet others at the event to help make your idea a reality. 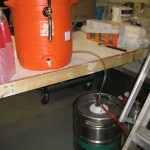 Donâ€™t have an idea, but want to work on a fun project? Attend as a free agent and bring your skill set (whatever it may be â€“ programming, glass blowing, marketing, etc) and find an interesting project there to work on and bring to life. 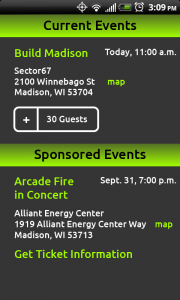 Be sure to register for this on the Build Madison website, and check out the live blog from the last Build Madison. We hope to see you there! CE member Michael Fenchel’s mobile art collective was also highlighted, as well as the upcoming Build Madison – a 24 hour community create-a-thon taking place at Sector67 this weekend. 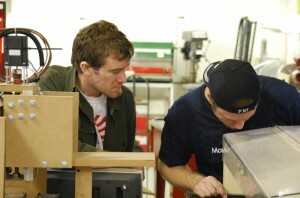 The first ever Build Madison wrapped up a successful event last weekend. 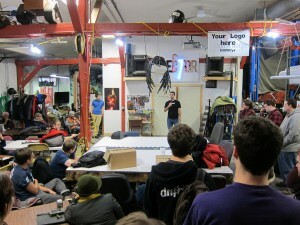 Over 50 participants gathered to work on 10 different projects at Sector67 on Madisonâ€™s east side. Build Madison is a â€œCommunity Create-a-thonâ€ where people of all ages and skill sets came together to turn ideas into real products in 24 hours. The event started at 11am Saturday with an idea pitching session, where anyone could pitch an idea for a potential project to work on. Dozens of ideas spanned a wide range of topics, and participants then formed teams to work on different projects. Teams started by planning and designing, then proceeded to implement their idea and turn it into a real product. 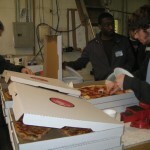 Google sponsored snacks, a fully stocked refrigerator of drinks, and pizza for participants. 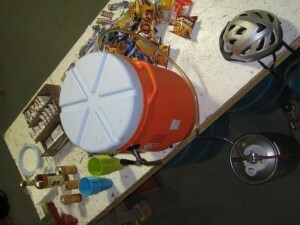 Flatt Cola provided an endless supply of energized cola to keep everyone on their toes. Teams worked diligently throughout the day and into the evening, with many teams working through the night in an effort to complete their projects on time. 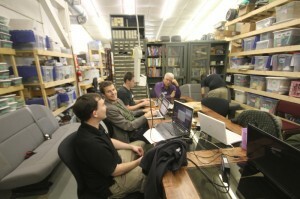 Everyone gathered on Sunday at 11am for final project presentations and demos. Teams showed off their projects to a packed room as judges kept an eye out for the top projects. After the presentations wrapped up, judges then conferred and chose the top teams. Be sure to also check out the live blog, time lapse video, and some pictures. Thanks goes out to all the participants and sponsors who made this a great event. Winner of $500 in cash from PerBlue and 1 year of virtual co-location service from SupraNet. 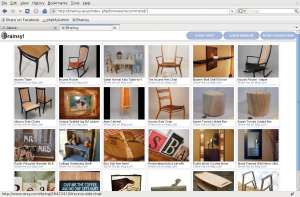 Brainsy is a web application that provides a better way browse Etsy.com handmade goods. You start by picking from a random assortment of products. Other products are recommended to you based on an algorithm that predicts your preferences. 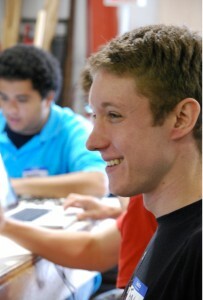 Brainsy was built by Corey Losenegger, Aaron Larner, and Pitt Fagan, web developers at EarthIT. Check out the demo at http://brainsy.star-man.org. Winner of 1 year Enterprise Package social media service from Ring & Klingelhoets and HD Movie Studio Plantinum software from Sony. 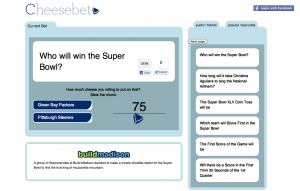 Cheesebet.com is a social gambling website with digital cheese instead of money where the bets themselves are added and scored live during sporting events. Our goal as a team was to design, build and launch the website as one fluid process so that it could be live for the Super Bowl the next day. Right now, bets are submitted and scored by our team, but we would like to add a crowd-source component so that our users themselves can submit and score bets in real time. May the cheesiest fan win! Winner of the runner up glassware from SupraNet. 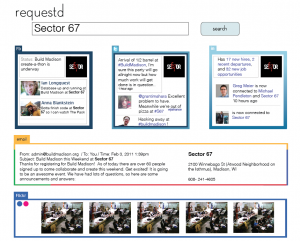 Requestd.com is a personal search engine. 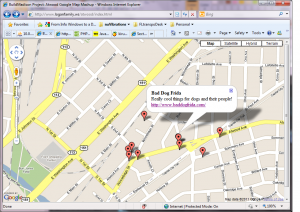 Find information from your Facebook, Twitter, Picasa, and other online accounts by searching in one central place. Winner of HD Movie Studio Plantinum software from Sony. 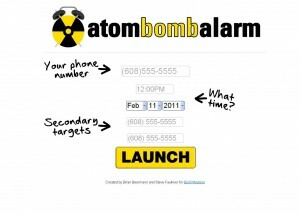 Atom Bomb Alarm is a wake up call that also calls your friends in the event you donâ€™t pick up or your phone is turned off. Alarms are scheduled via a simple web interface. Users also input two additional backup phone numbers. If the primary phone number doesnâ€™t pick up, the backup phones are called and told, â€œGo wake your friend up! They missed their alarm!â€ Perfect for ultra critical moments when you need more than a traditional alarm. 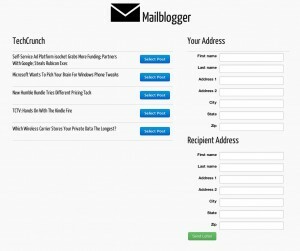 The service is live at www.atombombalarm.com. 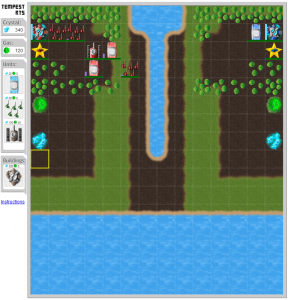 Tempest is a real time strategy game in HTML5 which took inspiration from Tempest Chess, a real time chess variant. We built the core infrastructure, AI, artwork, and gameplay. It can be played at here. iTalkBack is a free text to speech application. 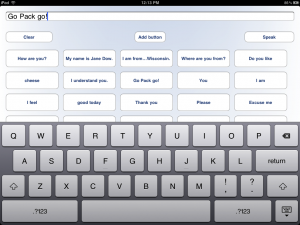 The iTalkBack app turns the iPad into a communication device for those who need speech assistance. This iPad application replaces very expensive dedicated communication devices while providing great ease of customization that can be performed by users and/or their caretakers. Please follow us for update and release information. Raffle winner of the $100 credit to Murfie.com. Many people have used and sworn at X-10 remote appliance controllers for decades. They provide plug-in modules into which you can plug lights and appliances, and then remotely control the modules (and the attached devices) from hand-held key-fobs or timer-controllers or day-night controllers. 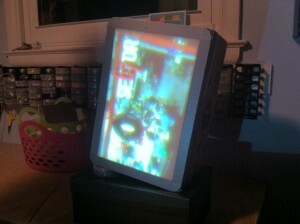 X-10 is very flakey in use, the modules fail often and are increasingly expensive. High-tech replacements (ZigBee/Lustron et all) are massively more expensive yet. 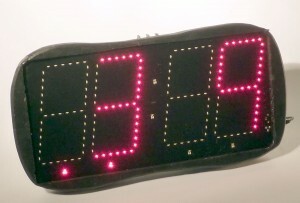 This project’s goal was to prototype a timer-controller to use with cheap, off-the-self 434 Mhz RF-controlled appliance modules. 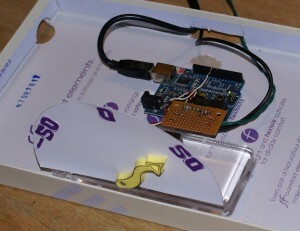 An Arduino micro-controller would be hooked to a postage-stamp-size RF transmitter; software on the Arduino would receive commands over its serial port to set timed events (a device to be turned on/off daily at a stated time) and would continuously scan its table of stored events, executing them as their time arrives. 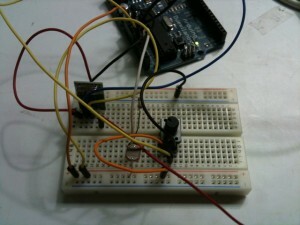 A user interface running on a laptop would be developed to create event lists and download them to the Arduino’s serial port. Using some code snippets from prior Sector67 Arduino classes and an RF transmitter I bought from Chris on the spot, I spent about 5-6 hours developing and debugging a working prototype, using the open-source Arduino development tools and and using LiveCode (www.runrev.com) on the laptop side. 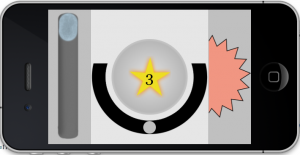 I built a casual game for the iPhone, tentatively called “Tap It.” The gameplay works very similarly to an orignal “Bop IT!”. 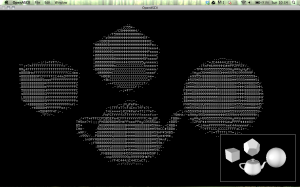 A sound plays telling the player what to do, and then the player must do the action fast enough to continue playing. As time goes on, the gameplay gets faster. itself. The result is free external comment hosting (like Disqus) provided by a forum with a large and engaged community of tech professionals. 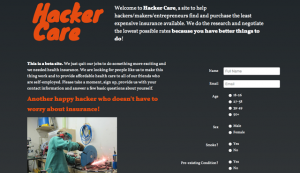 More information is available at http://will.m.aier.us/ycomments. The project is intended to provide a map of points of interest in the immediate vicinity of Sector 67. The map centers on Sector 67, but there is nothing preventing points of interest from being added at any location on the planet. makerbits.net is a website inspired by ravelry.com, thingiverse, and many other maker related websites. makerbits’ goal is to be a repository of parts, datasheets, projects, and to give users the ability to track their stuff and lend/sell parts and tools to other makers in need. 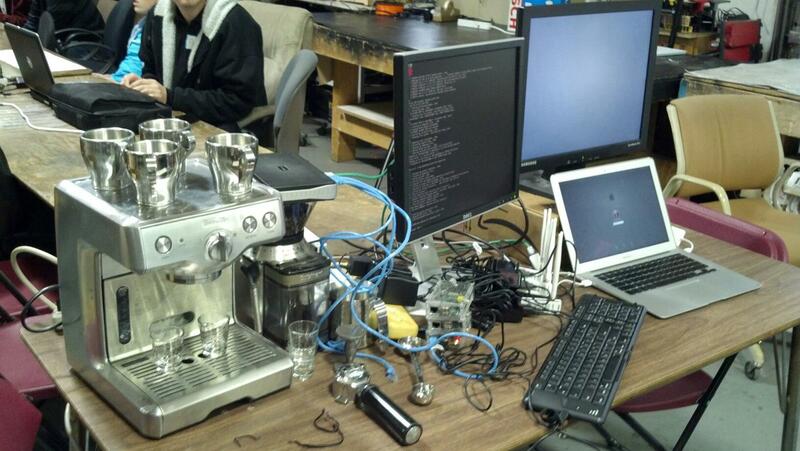 It also is designed to help hackerspaces and other shared work environments more organized. 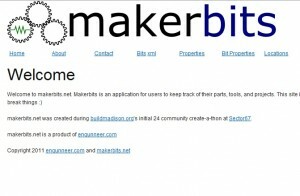 makerbits.net is a work in progress, and should be live in a few more weeks. 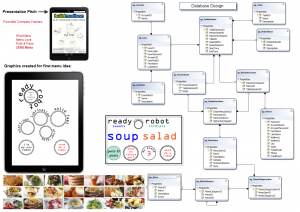 The goal of our project was to make a menu and point-of-sale system on a tablet device. Each restaurant would be able to create their own distinctive menu, and provide as much data as they wanted for each item. 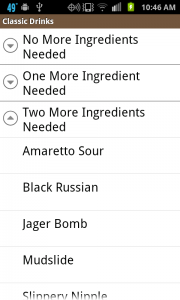 We created a category & sub-category system that would allow diners to filter menu items down, such as “Vegetarian”. Patrons would be able to create their profiles, which would contain their payment options, accumulate loyalty rewards the restaurant might offer, and the entire table could easily split their checks for individual payment. 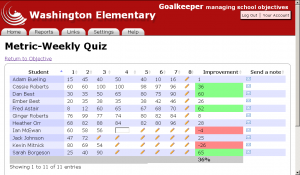 We chose .NET & C# for our tools to create this web service. Unfortunately we were unable to finish in time. 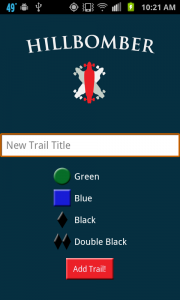 We finished creating the database, inserted 42 menu items with pictures, graphics for an example restaurant, and created back-end maintenance screens. 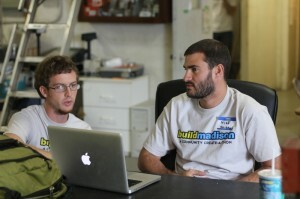 Capital Entrepreneurs is organizing Build Madison which is taking place February 5th and 6th. It’s a 24 hour create-a-thon (think hackathon + startup day + just building cool stuff). There is even a $500 cash prize (plus other prizes) going to the top teams. If you have an idea for a cool project to work on (whether it be a website, widget, or pretty much anything really) this is your event. Bring your idea and meet others at the event to help make your idea a reality. 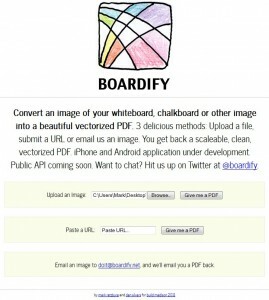 Don’t have an idea, but want to work on a fun project? This is your event too. Bring your skill set (whatever it may be – programming, glass blowing, marketing, etc) and find an interesting project to work on and bring to life. For more information check out www.buildmadison.org. Calling all creative, talented and enthusiastic Madisonians! Come together to unleash and show off our communityâ€™s potential by cooperatively creating real products in less than 24 hours. Connect with people to make your idea a reality or utilize your skill set and experience to help bring other exciting ideas to life- all while meeting cool people and generally having a blast. Plus, thereâ€™s prize money and packages for teams with the most impressive results.